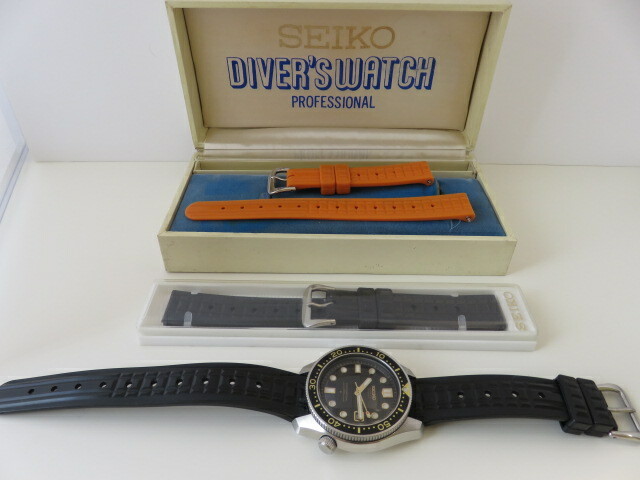 In 1969 Seiko followed up their first designed dive strap the ZLM01 “waffle” that had been introduced two years earlier. 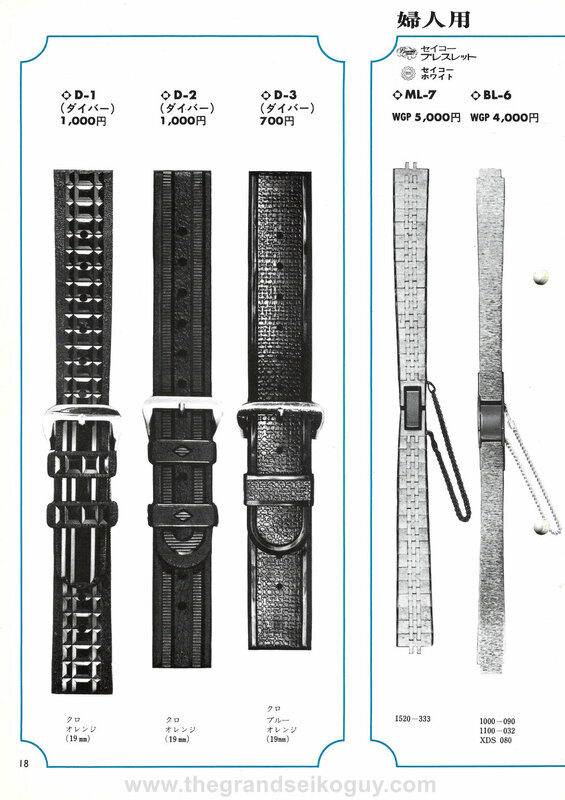 This newly introduced strap has an unknown mode name / part number but is commonly referred to as the “Chocolate Bar” due to the raised pattern on the straps top surface. 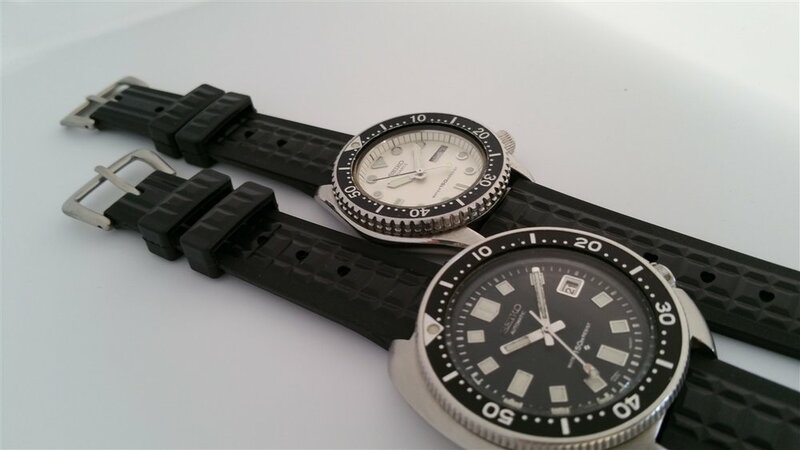 The strap was introduced on both models of the first Seiko 300m Professional diver, the 6159 010 and 6159 011 (6159-7000). This model initially was initially supplied with the ZLM01 strap but this was changed to the new Chocolate Bar design in early 1969 and this continued until the end of the models production run. The only other model this strap was fitted at the factory with was the 61MC 022 (6105-8110) from its introduction in late 1970 until late 1972. Towards the end of 1972 the 6105-8110 was changed to the XGL-731 “Tire Tread” strap. The Chocolate Bar is made from the same materials as the ZLM01 waffle strap and has a slightly shiny inside surface. It is very soft and pliable and generally has held up over the years much better than the later model vented straps that are produced from different compounds. 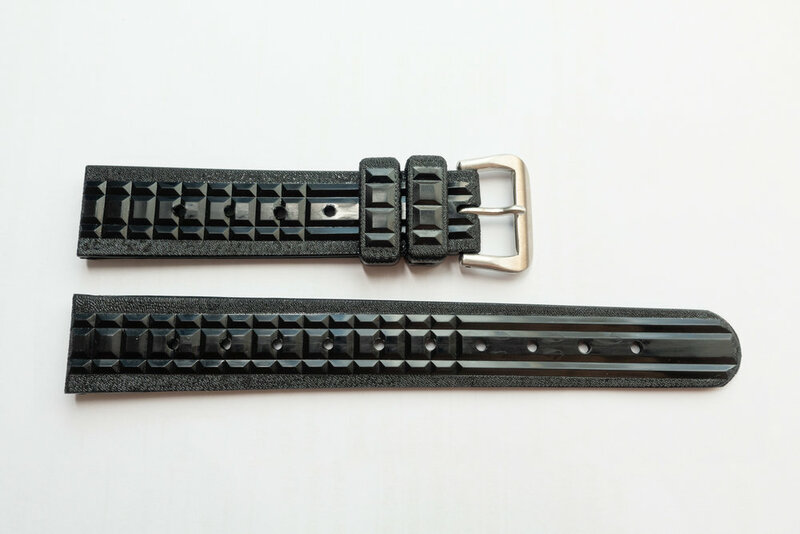 The strap is designed for a 19mm size lug width and the length of the tail section is just under 130mm while the buckle half of the strap measures just under 81mm. The straps taper slightly over their length with the tail section narrowing to 15mm at the tip and the buckle section narrowing to 16.5mm at the buckle. The tail section has ten holes in the strap while the buckle end has five holes to balance the design. The distinctive pattern on the strap consists of a central row of raised sections that are surrounded on each side by a slimmer row. This raised section is a consistent width along the strap while a textured outer edge is reduced to accommodate the narrowing of the strap. The raised top of the strap is divided into sections that are reminiscent to the individual sections on a bar of chocolate, hence the nickname. The division of the central raised section ceases for the lower 55mm of the tail section allowing it to be easily pulled through the buckle. 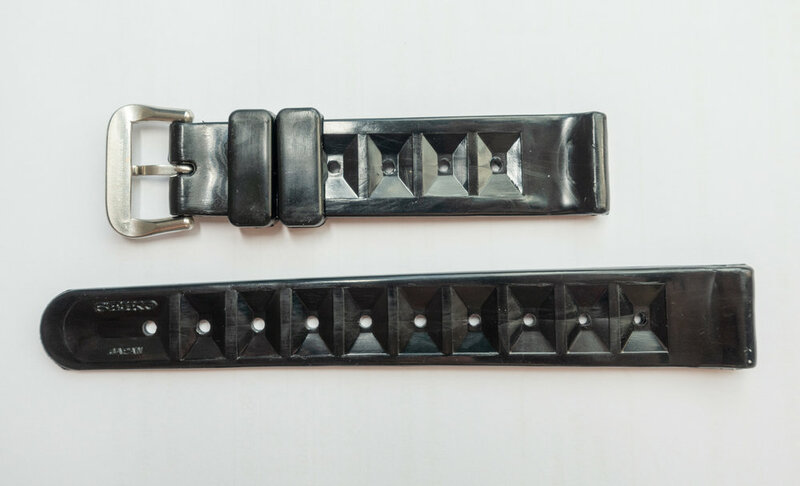 The buckle section has a similar continuous section of 34mm to balance the design. On this example the end portion of the tail section has a series of curved marks that appear to be part of the original molding process. The rear surface of the strap has a series of rectangular depressed sections to help provide better grip and to increase ventilation on the wrist. These cut-outs are a similar design to those found on the ZLM01 waffle strap and later XGL731 tire track models. If you look closely on the back of the strap you can see a faint central line that is part of the moulding process. The small pip mark that is found on the tip of the ZLM01 is not present on the Chocolate Bar. On the rear tip of the tail section there is the Seiko logo and below this the text Japan. This is the same design as found on the later XGL731 and differs slightly from the ZLM01 with the kerning of the JAPAN text different to that model. 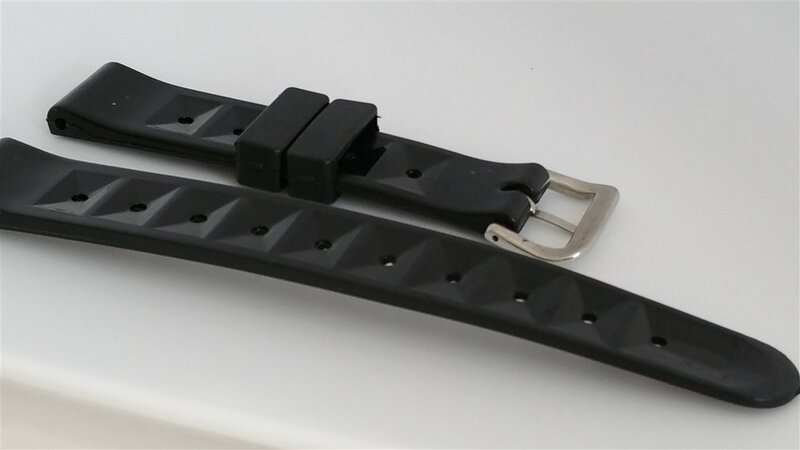 The strap is 3.2mm thick for the main section of the strap but thickens at the spring bar section to 6.4mm to accommodate the Seiko fat 2.5mm bars. The buckle end of the strap thickens to 5.2mm. 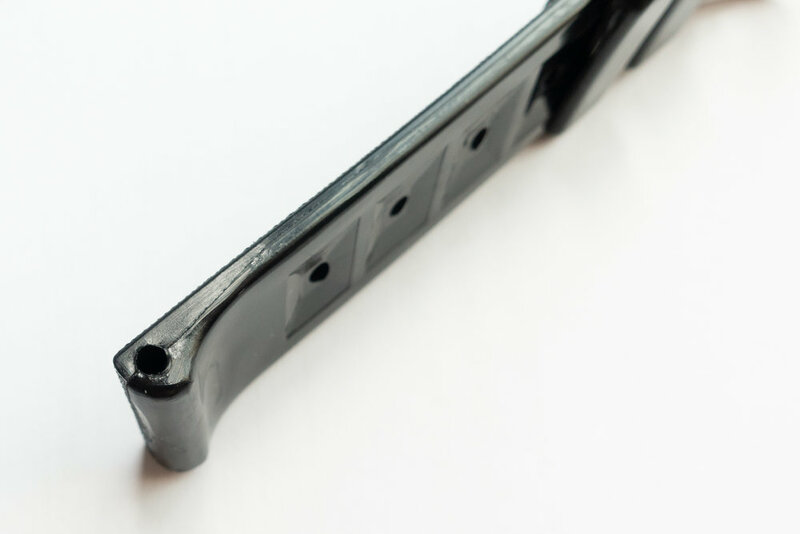 The molding marks on the side of the strap follow the center line of the main section then angle down to pass through the center of the spring bar hole. On the strap there are two keepers that are topped with two large raised sections and two smaller outer raised sections that mimic the main strap pattern. These keepers are 8.3mm wide and 7.7mm high. The flared buckle is stamped SEIKO.ST.STEEL.JAPAN.G and the tang has a rounded top surface and flat rear surface. The buckle is at its maximum point 25mm wide with a length of 15.3mm and a thickness of 3.4mm. The most commonly seen version of this strap is in black but there was also an orange version of this produced. I have seen the orange variant offered for sale with a small number of 6159-7000 watches and these appear to have been provided as a second strap. This second strap is not detailed in any of the Seiko watch catalogs or promotional materials I have been able to locate. 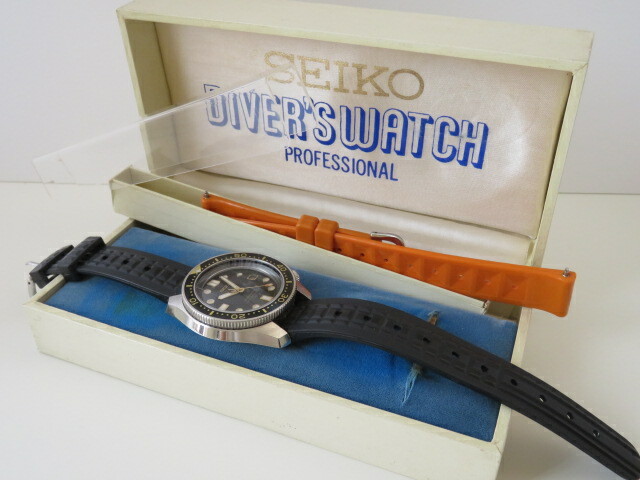 The first official documentation I have seen confirming the existence of the orange variant of the chocolate bar strap was in the Seiko 1972 No.1 Watchband Catalog. 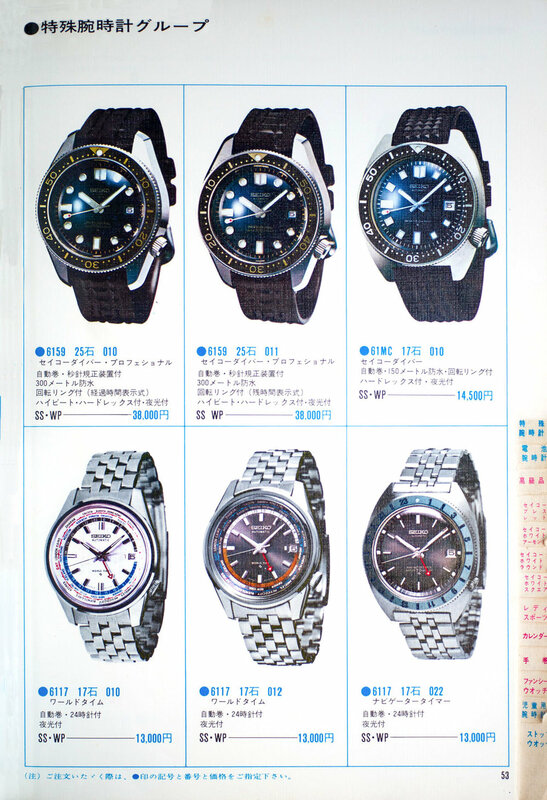 You will note that the catalog states the reference as D-1 (presumably Dive 1), then (Diver), and the price of ¥1,000. On the lower section of the page it lists the two color options Black and Orange as well as the size (19mm). 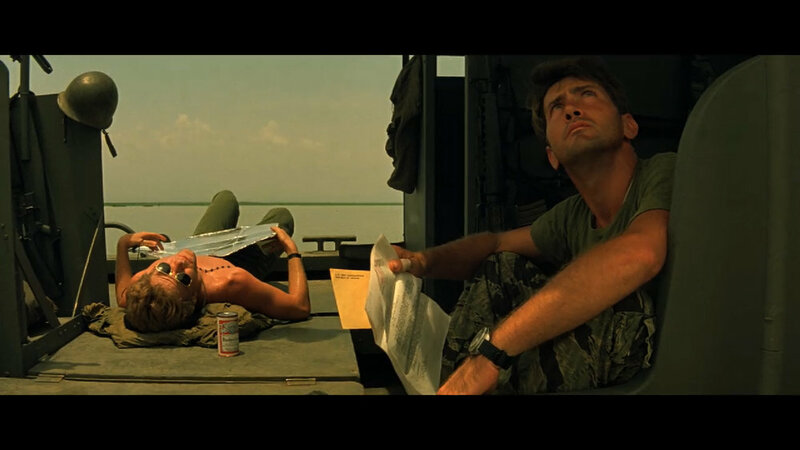 This strap was also highlighted in the 1979 Francis Ford Coppola movie Apocalypse Now where it was worn on a 6105-8110 by the character Captain Benjamin L. Willard played by Martin Sheen. This is the reason behind the second nickname for the strap where it is sometimes referred to as the “Willard” strap. 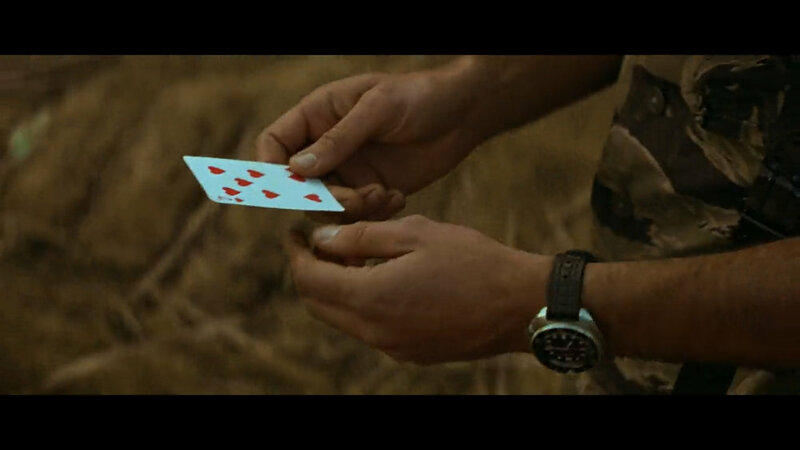 The watch and strap can be seen clearly in a number of scenes throughout the movie and this has made it popular with fans of both the movie and the watch. These straps are not commonly found now and when they do come up for sale are usually priced around $400-500 (2018 USD pricing). Luckily for people wanting to get an authentic look for their 1969 or later 6159-7000 or 1970 to 72 6105-8110 there is an alternatives. A reproduction of this strap was released a number of years ago from WJean (www.strapboutique.com). These straps continue to be available today and they are a great alternative for anyone who is wanting to have the original look on their watch but wants the confidence of a new strap made from modern materials. The reproduction versions of the strap thankfully do not have the Seiko branding so are very easy to differentiate from the originals. Like the ZLM01 waffle and XGL731 tire track the Chocolate Bar strap is a unique Seiko design that perfectly suits the dive models from that period.